If you ever make it to Austin, don’t forget to check out a few highlights. 1. Stay at the Hotel San Jose on South Congress street. There is no other tranquil place like this in that city. Calm, understated, contemporary, relaxing, still right where you find the hip and edgy. 2. Check out the music scene on 6th Street. 3. Walk over Congress Bridge and imagine what is underneath. 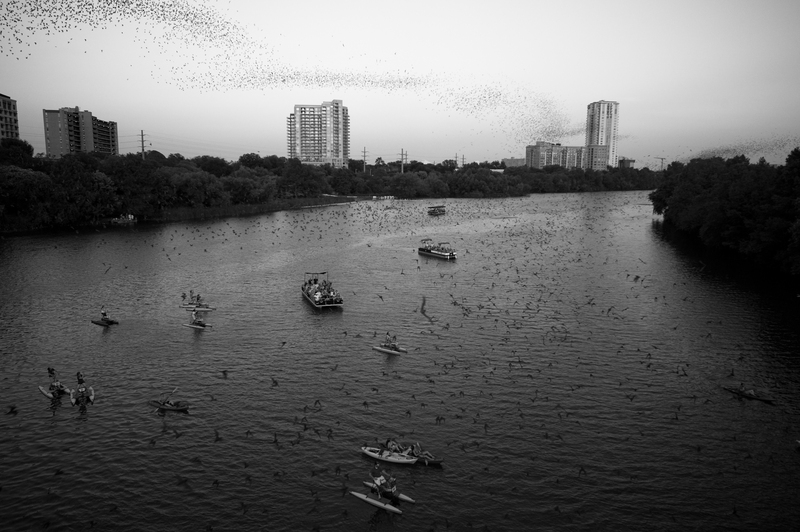 During the day around 1.5 million bats stay inside the bridge and take long naps. Right around dusk they seem to wake up and fly off the bridge to find food. Seeing this mass of bats forming a long cloud that quickly makes its way to the horizon is truly amazing and probably one of the few urban, animal spectacles on that globe. Where is the best spot to see it? Some stay on a grassy area on the south side of the bridge, some come by boat. I think being on the bridge is a pretty good place to watch and stay poop free. Learn more about the bats here.